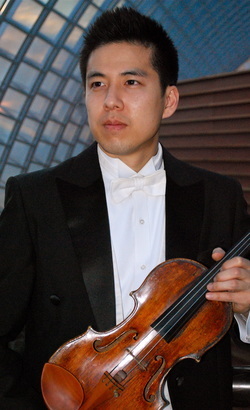 Daniel Han joined The Philadelphia Orchestra in 2006 after having been a member of the Minnesota and Fort Worth Symphony Orchestras, as well as guest concertmaster of the Daejeon Philharmonic in Korea. He received his BM, MM and AD from Boston University, where he was a student of Roman Totenberg. A native of Lexington, Kentucky, Mr. Han studied with Kurt Sassmannshaus and Dorothy DeLay at the University of Cincinnati College-Conservatory of Music Preparatory Department. While there, Mr. Han was a frequent soloist with the CCM-Starling and Philharmonia Orchestras, as well as one of the concertmasters of the Starling Chamber Orchestra, performing with them as soloist in Lincoln Center, at the Aspen Music Festival, and on their tours to Germany, Switzerland and Austria. He has also been a soloist with the Fort Worth Symphony Orchestra, the Boston Classical Orchestra, the Boston University Symphony, the Longy Chamber Orchestra, the UK Symphony, and the Northern Kentucky Symphony. An avid chamber musician, he has been a part of various ensembles, most recently performing throughout Europe and Asia. Mr. Han attended the Aspen Music Festival, Kneisel Hall, and Bravo! Vail Valley Music Festival and has also been a guest artist at the Music in the Mountains, Philadelphia International Music and Kingston Chamber Music festivals.